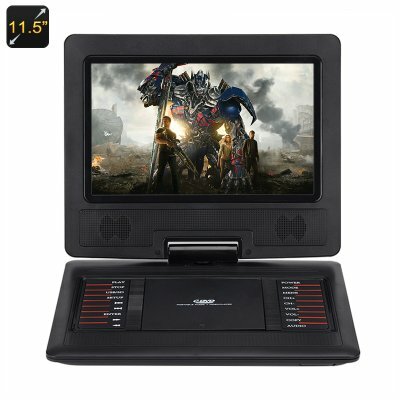 Successfully Added 11.5 Inch Portable DVD Player - 270 Degree Rotating Screen, 1366x768 Resolution, Copy Function, Game Emulation, 1200mAh Battery to your Shopping Cart. Easy DVD viewing anywhere and anytime. With a 11.5 inch screen this portable DVD player is light and durable making it a great travel companion. With a 1366x768 resolution you can enjoy fantastic viewing and the 270 degree rotational screen lets you find the perfect viewing angle for the whole family. Supporting a wide range of formats and allows you to choose from a wide range of DVDs while the USB and SD card inputs lets you view downloaded content easily without having to burn movies to a disc first. This DVD player has anti-shock resistance and by constantly scanning ahead it can ensure that if there is a bump in the road or sudden movement to the player you won’t find the movie skipping or jumping. This means you can enjoy uninterrupted viewing of movies or listening to music. Its not just movies and music that this player can provide for entertainment, with classic arcade game emulation you can have the nostalgic enjoyment from age old classics with that world famous pixilated plumber or do battle with Ryu’s Hadoken. If you run out of moves for those classic games then you can always watch TV as this portable DVD player has its own aerial so picking up your favorite channels shouldn't be a problem. A 1200mAh rechargeable battery allows for an hour and a half of operation. If the power runs out then you can use the car charger or standard wall charger to keep on playing or top up the battery. This product is in stock now, we guarantee next working day shipping and offer a 12 months warranty on all our products. Brought to you by the leader in electronic devices as well as wholesale portable DVD players, Chinavasion..